1 Prosecutor v. Nahimana, Barayagwiza, & Ngeze, Case No. ICTR 99–52–T, Judgment and Sentence (Dec. 3, 2003) (reported by MacKinnon, Catharine at 98 AJIL 325 (2004)). The judgments and basic legal documents of the ICTR are available on its Web site, <http://www.ictr.org. 2 Prosecutor v. Nahimana, Barayagwiza, & Ngeze, Case No. ICTR 99–52–A, Appeals Chamber Judgment (Nov. 28, 2007). Under the ICTR’s Statute, Ngeze was convicted under Article 6(1), which provides for individual responsibility for someone who “planned, instigated, ordered, committed or otherwise aided and abetted in the planning, preparation or execution” of a crime under the ICTR Statute (Appeals Judgment, paras. 775, 886). Nahimana was convicted under 6(3), making a superior responsible who “knew or had reason to know” a subordinate was about to commit a crime or who failed to prevent or punish such crimes (id., paras. 822, 834, 856). 3 The trial chamber thought that “there need not be a call to action in communications that constitute persecution.” Trial Judgment, para.1073. 4 The amicus curiae brief of Open Society Justice Initiative at 15–16 [hereinafter OSI Brief], at <http://www.justiceinitiative.org/db/resource2?res_id=103601, was more circumspect. 5 General evidence of his superior responsibility for CDR and Impuzamugambi exterminations and genocidal acts was found insufficient (Appeals Judgment, paras. 861–62, 882–83, 946). His personal responsibility for specific acts was upheld (id., paras. 661–63, 665, 946, 1002). 6 Much of this evidence also went to genocidal intent—for example, for Barayagwiza, using slogans calling for extermination of Tutsi (id., para. 539) and forcing Tutsi women to dance naked (id., paras. 548–49), and for Ngeze, all Kangura articles and editorials (id., para. 565). 7 Rwanda strongly protested this start date for the Tribunal’s jurisdiction as unrealistic. UN Doc. OCS/PV.3453, at 14–15 (Nov. 8, 1994) (remarks of Rwandan delegation). 8 The question of recirculation is treated as a fact not charged (id., para. 407), while the question of “publication” is as much a legal issue though not even glimpsed as such here. 10 Der Stürmer began roughly weekly publication in 1923. The Holocaust is often dated as starting in 1933 at Dachau’s construction. Streicher was editor to 1933, publisher to the end: Der Sturmer, 23 Jahre Nummer 8 (Niirnberg, 22. Februar 1945). 11 See Brandenburg v. Ohio, 395 U.S. 444, 447 (1969). 12 Compare, e.g., OSI Brief, supra note 4, at 28, and Meron partial dissent, paras. 5–8, with 22 Trial of the Major War Criminals 547–49 (1948) (convicting Streicher for crimes against humanity for, among other things, “25 years of speaking, writing, and preaching hatred of the Jews,” “infect[ing] the German mind with the virus of anti–Semitism and incit[ing] the German people to active persecution”). 13 Timmermann, Wibke Kristin Incitement in International Criminal Law , 88 Int’l Rev. Red Cross 823, 830 (2006) (describing Hans Fritzsche Judgment, Aktenzeichen 1/2398, Spruchkammer I, Stadtkreis Nurnberg, Jan. 31,1947, S taatsarchiv Munchen, SpKa Karton 475). This useful article argues that instigation should be treated as an inchoate crime like incitement, and that incitement should apply to all international crimes, not only genocide. 14 Masses Publ’g Co. v. Patten, 244 F. 535, 541 (S.D.N.Y. 1917) (Hand, J.). 15 The inverse is found in the axiom “Every idea is an incitement,” Gitlowv. New York, 268 U.S. 652, 673 (1925) (Holmes, J., dissenting), which I do not think is true. 16 ICTR Statute, Art. 2(3)(c) (direct and public incitement to commit genocide); id, Art. 6(1) (instigation). 17 See Prosecutor v. Akayesu, Case No. ICTR–96–4–T, Judgment, para. 562 (Sept. 2, 1998). 18 Prosecutor v. Musema, Case No. ICTR–96–13–T, Judgment, para. 120 (Jan. 27, 2000). 19 Prosecutor v. Blaskič, Case No. IT–95–14–T, Judgment, para. 280 (Mar. 3, 2000); Prosecutor v. Semanza, Case No. ICTR–97–20–T, Judgment and Sentence, para. 381 (May 15, 2003) (instigating as “urging, encouraging or prompting” another). 20 Schenck v. United States, 249 U.S. 47 (1919). Brandenburg is regarded as making this test more temporally immediate as well. 21 For more on 6(1) and 6(3) under the ICTR statute, see supra note 2. 22 The Appeals Chamber is even eager (Appeals Judgment, para. 663). 23 The incitement convictions were under 6(1), the persecution conviction under 6(3). A remorseful, on–air RTLM journalist pleaded guilty and was sentenced for both incitement to genocide and persecution under 6(1). Prosecutor v. Ruggiu, Case No. 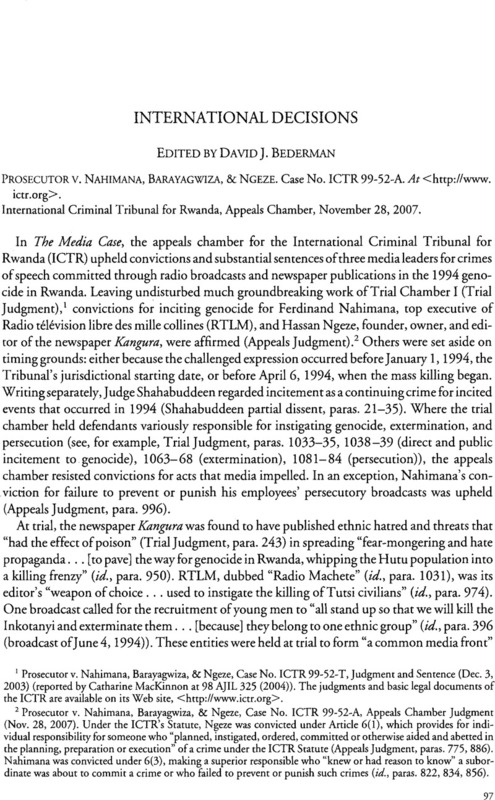 ICTR–97–32–I, Judgment and Sentence, paras. 10–12, sec. IV (June 1, 2000). He did not appeal. 24 They predictably will, including under the Rome Statute of the International Criminal Court—Article 25(3)(e) for direct and public incitement to genocide, or Article 25(3)(b) for “induc[ing]” crimes.